After 9 years of promotion at the forefront of the tech Drum & Bass scene in London, the time has come for Tech:nology to present to the world their own brand of heavy-hitting, floor shaking Drum & Bass. 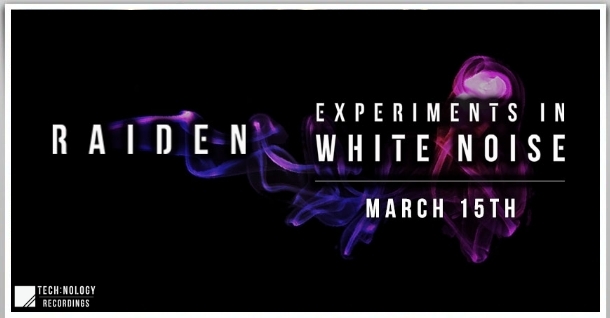 2014 sees the first release from the new founded Tech:nology Recordings: 'Experiments In White Noise', courtesy of the mighty Raiden. This is a forward thinking four track EP exploring the use of white noise in dance music. In combination with beautiful use of drum breaks, atmospheric pads and dark and intricate synth lines, this EP sets the bar very high! Rust's gritty industrial tone, like the name, would be well at home in an abandoned warehouse. With one of the most unique and distinctive sounding leads in the EP, this one is sure to turn heads. Jaw dropping sound design and pumping bassline combined with Raiden's masterful synth work, creates a unique track that will get bodies moving! Football fans out there will know where this name originates; Raiden's hometown: Portsmouth, and its infamous '657' Portsmouth FC Firm. Its aggression is obvious from the opening bar, and continues with an oldskool extended intro and some classic rolling Drum & Bass rhythms; all spatted with countless drum break layers and sparkly rides. Before the drop even hits we're treated to classic Raiden filth with huge, menacing stabs layered with crunchy, speaker shattering bass. As the track drops and progresses, the onslaught of found sounds, atmosphere and amazing synthesis is relentless. This one you can listen to over and over and still hear something new every time!